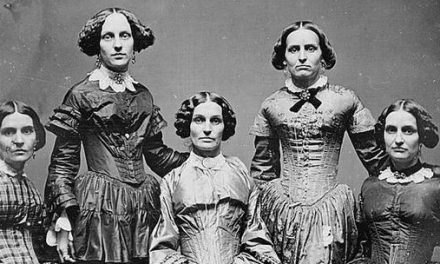 In 1866 belted dresses became quite fashionable—replacing the pointed bodices previously en vogue. Ribbon trimmings were preferred to artificial flowers. lfred Stevens’ La Dame en Rose (Fig. 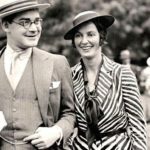 1) shows a woman wearing a fashionable dress of the time. 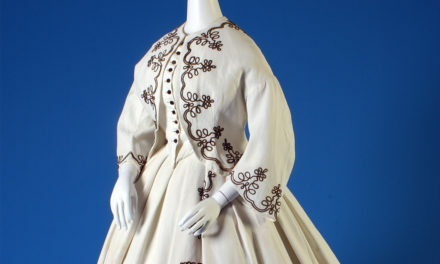 The garment has elaborate tiered lace trimmings on the skirts, collar, sleeves, and shoulder seams. It also has a ceinture at the waist to accentuate the wearer’s figure, rounded shoulders, and a slight train. The fabric is a light pale pink and while there are no bright ribbons to offset the pale fabric, the garment can still be described as fashionable. The wearer is showing her stylishness by choosing a select number of trends to wear rather than putting them all on her dress at once. Several changes in the popular style of dress for 1866 are noted in the January issue of The World of Fashion. First it points to the adoption of round waists with a ceinture, or belt–a shift from the previously popular pointed waist lines. Another notable change is the abandonment of flowers used as trimmings in ball dresses, which are now used scantily, if at all (Fig. 6). 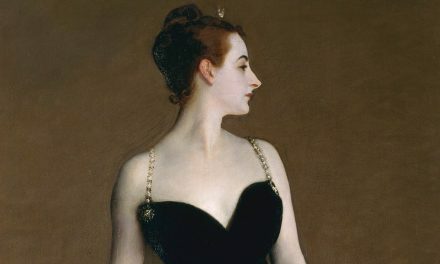 Instead fashionable women of the time turned to “ribbons in bands, in bows, and in rûches, and lace both black and white,” to adorn their evening gowns (4). nother popular style are dresses with double skirts; the under skirt is commonly made out of silk due to the fabric’s lightness and breathability. 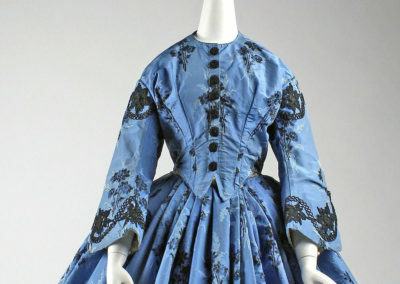 The sleeves of these dresses are cut straight with ornamentation on the shoulders and wrists, the seams do not sit directly on the shoulders but slope slightly off the shoulder to create a rounded silhouette (Fig. 4). As the year progressed The World of Fashion noted in April a new design, the Princess Robe growing in popularity, this is characterized by the lack of a seam at the waist with less fullness in the hip area but stayed consistent with the presence of a train and full back (4). For promenade wear the upper skirts of the women’s dresses are looped up with cords to show the petticoats; due to their exposure the petticoats are made using the same fabric or a complementary fabric as the upper skirts. The dresses are typically blue, gray, pink, white, or black though most vibrant colors are considered novel. The dresses are trimmed with complementary ribbons and lace. The most common print is stripes, followed by plaid. In May 1866, The World of Fashion notes that the length of the skirts are cut to display the boots worn underneath (4). “Central Europe and Low Countries, 1800–1900 A.D. | Chronology | Heilbrunn Timeline of Art History | The Metropolitan Museum of Art.” Accessed August 3, 2018. https://www.metmuseum.org/toah/ht/10/euwc.html. “Fashions for November.” Peterson’s Magazine 50 (November 1866): 362. https://babel.hathitrust.org/cgi/pt?id=inu.32000000716060;view=1up;seq=368. “France, 1800–1900 A.D. | Chronology | Heilbrunn Timeline of Art History | The Metropolitan Museum of Art.” Accessed August 3, 2018. https://www.metmuseum.org/toah/ht/10/euwf.html. “From Our French Correspondent.” London and Paris Ladies’ Magazine of Fashion 39, no. 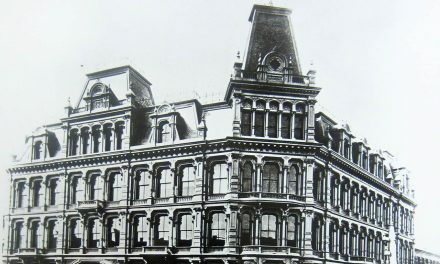 435 (May 1866): 51–53. https://play.google.com/books/reader?id=4iEGAAAAQAAJ&printsec=frontcover&output=reader&hl=en&pg=GBS.PA51. “Observations of London and Parisian Fashions.” The Ladies’ Monthly Magazine, The World of Fashion 43, no. 515 (November 1866): 1. https://play.google.com/books/reader?id=SSQGAAAAQAAJ&printsec=frontcover&output=reader&hl=en&pg=GBS.PP94. “Observations of London and Parisian Fashions for April, 1866.” The Ladies’ Monthly Magazine, The World of Fashion 42, no. 508 (April 1866): 4. https://play.google.com/books/reader?id=SSQGAAAAQAAJ&printsec=frontcover&output=reader&hl=en&pg=GBS.PP76. “Observations of London and Parisian Fashions for January, 1866.” The Ladies’ Monthly Magazine, The World of Fashion 42, no. 505 (January 1866): 4. https://play.google.com/books/reader?id=SSQGAAAAQAAJ&printsec=frontcover&output=reader&hl=en&pg=GBS.PP22. “Observations of London and Parisian Fashions for May, 1866.” The Ladies’ Monthly Magazine, The World of Fashion 42, no. 509 (May 1866): 4. https://play.google.com/books/reader?id=SSQGAAAAQAAJ&printsec=frontcover&output=reader&hl=en&pg=GBS.PP94. Julia Trantel is a student studying Advertising and Marketing Communications at the Fashion Institute of Technology (class of 2018). She is an Economics, English, and Art History minor. She researched and wrote this while enrolled in HA 301: Fashion and Impressionism (Honors), taught by Prof. Justine De Young, in Spring 2017.